Volkswagen diesel defectors may be salivating at the promise of a Cruze diesel sedan or hatch, but those models won't go on sale until next year. The 2017 Chevy Cruze adds a hatch to the family that retains the same good ride and ample space, without being boomy or loud. The world is full of compact cars like the Chevrolet Cruze, so this year the Chevrolet Cruze becomes more like other global compact cars. It does it in two ways. 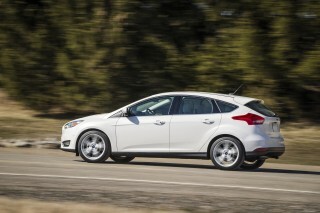 One, it adds a hatchback model, the cleverly named "Cruze Hatch." It marks the first time a five-door Cruze has been offered in the U.S. Two, it brings back the diesel to the Cruze lineup, in the sedan first (coupled to a 9-speed automatic) and to the hatch in 2018. Sedans are offered in base L, LS, LT, and Premier trims, while hatchbacks are sold only in top LT and Premier trims. RS sport-appearance packages are available in both cars, but only on LT and Premier levels. The Chevrolet Cruze cuts a sleeker hole through the wind—in both hatchback and sedan form. There isn't much to separate the two versions from the rear doors forward, although the brute-force versatility of the hatch suffers a little from the curvier roofline. Inside, the Cruze is decidedly modern without being too digital, an attractive layout that gets better in pricier trims. Under the hood (for now) the Cruze is powered by a 1.4-liter turbo-4 that makes 153 horsepower. It's paired to a standard 6-speed manual is most trims, upper trims get the 6-speed automatic as standard. In all cases, the Cruze is a front-driver, suited more toward daily duty than quick sprints through canyons. We've found that there can be some hesitation in the Cruze's driveline; but it's hard to find a culprit: the small displacement turbo-4 or a juddery transmission. The panacea for both may be a coming turbodiesel inline-4 that will significantly increase torque and a new 9-speed automatic. We haven't yet driven those models, so stay tuned. The Cruze may have the footprint of a compact, but its interior is certainly closer to mid-sized. Back-seat passengers get more than 36 inches of leg room, and the ample-sized trunk measures 13.7 cubic feet—near the top for the compact class. Opt for the hatchback and that rear cargo area balloons to 23.7 cubic feet with the rear seats up—47.2 cubic feet with the seats down. That curvy roof line cuts into vertical space for the hatch, and even makes the smaller subcompact Sonic hatchback more spacious by the numbers. Nonetheless, it's a comfortable car for four, and something we wouldn't fear spending a day driving around town. Curiously, safety is still somewhat of an unknown in the Chevy Cruze—there isn't much official data since it was new last year. Short of a comprehensive rundown of crash data from the IIHS or federal testers, the Cruze comes equipped with the standard suite of airbags and stability control systems. Advanced safety packages are available in the Cruze, including forward collision warning, blind-spot monitors, and rear park assist alerts. Notably missing from the list: automatic emergency braking and adaptive cruise control. Both safety systems are noticeable omissions from Chevy, many other compact cars offer those features. Still, every Cruze comes with a rearview camera, which is some comfort. Base cars are very spartan and lightly equipped, and not likely to be seen on the roads by most buyers—they're fleet kings and queens. Most cars on dealers' lots will be LS and higher, which all feature a 7.0-inch infotainment display that includes Apple CarPlay and Android Auto, 16-inch wheels, Bluetooth, cloth upholstery, and GM's OnStar service that provides 3 GB/three months of 4G LTE mobile hotspot service before they start the monthly juice. Top Premier and LT trims are shod with leather and other creature comforts such as an 8.0-inch infotainment screen or dual automatic climate controls. 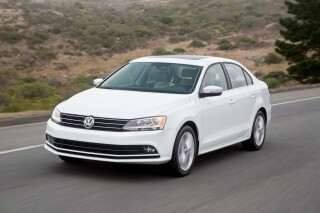 Most models will top out at $30,000, although upcoming diesel-powered cars could eclipse that mark. More modern and shapely, the Cruze cuts a sharp style for Chevrolet sedans. 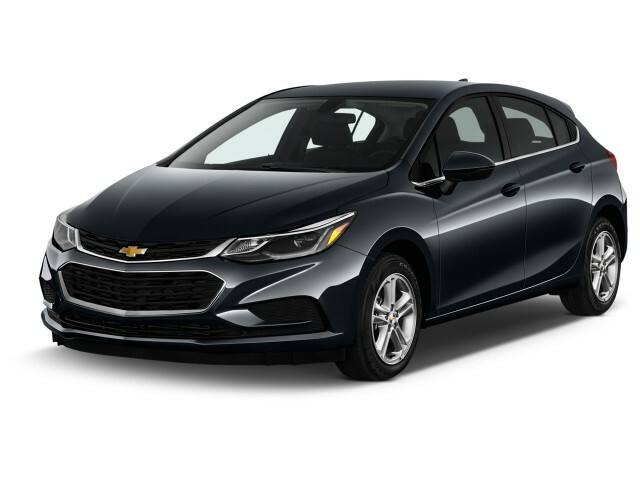 One year after a significant styling change, the Chevrolet Cruze is joined by a hatchback version that borrows heavily from the sedan. It's the first time a hatchback Cruze has been offered in the U.S. Despite losing 8 inches of length and adding one door to the rear, the hatchback version only deviates from the sedan behind the rear doors. The first four doors cut a familiar look, but the roof eases into a window-mounted spoiler and cascades down the back glass in the hatch. Because of the hatch doesn't deviate far from the sedan, the rear hatch isn't as large as expected. The opening is higher on the Cruze Hatch's bumper—which makes for easier loading and unloading—but doesn't make for an exceptionally large rear cargo opening. The Cruze is less upright than its predecessor, which was a classic three-box sedan with a defined trunk lid. 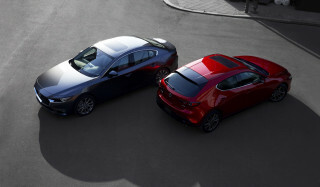 The new cars are more handsome, with a sleeker shape that pushes its wedge-shape profile from the rear window closer to the trunk lid. It's a profile Chevy has cut before; it borrows heavily from the Chevrolet Volt plug-in hybrid, in face. In either hatchback or sedan guise, the Cruze looks lower, leaner, and more sporty compared to the last generation, which carries over to the interior. The Cruze cuts a smaller hole through the wind—it's more aerodynamically efficient than the last model—but it's still easily spotted as a Chevrolet. The Cruze sports the same dual-grille front as the Volt, Malibu, and Impala sedans. There's a bit more brightwork on top end models, and LED lighting was added to headlights and taillights. The interior has underwent a similar rework as well. The nicest cabins are reserved for Premier models, which feature a two-tone trim and a 7.0- or 8.0-inch touchscreen. The layout is clean and sharp, skipping most of the budget materials that have sank Chevy interiors in the past. Overall, it's a modern look without being overly stylized or too digital for mainstream buyers. The car is low, lean, and distinctly sportier than its predecessor, and that carries over to the interior. Again very similar to that of the Volt, it has straightforward instruments in a pod in front of the driver and a 7.0- or 8.0-inch touchscreen display in the center of the dash on every model. Controls are logical and intuitive, and brightwork is used to outline them. The nicest interiors are the two-tone options on the Premier trim level, but all versions of the interior are a clean and cohesive design. Overall, it's modern without being overly stylized or too digital for mainstream buyers. The Chevy Cruze benefits from a comfortable ride in all trims—powertrain performance could get better soon. Only for now, the 2017 Chevrolet Cruze is powered by a 1.4-liter turbocharged inline-4 that makes 153 horsepower. Why hedge that? 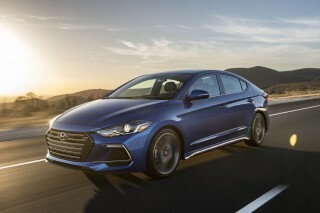 A new turbodiesel model is due to arrive this year for sedans (next year for hatchbacks) that could raise the available twist by nearly 80 ft-lbs and add a new 9-speed automatic. Chevy is keeping quiet on those details, but that turbodiesel inline-4 may be borrowed from the already-announced 2018 Equinox that could dramatically change the Cruze's character. According to Chevrolet, the Cruze sedan can scoot up to 60 mph in under 8 seconds, which is just enough to qualify as adequate. We're not sure where to point our fingers—the small-displacement turbocharged engine, or a laggy transmission—but we've noticed a perceptible hitch in the Cruze's get-along when stamping on the throttle. You'll find you will floor the car on that short, uphill highway on-ramp; the car will get you safely into traffic, but it doesn't have a lot of reserve left when it does. It helps that the Cruze is 250 pounds thinner than its predecessor two years ago, and that the car has been designed to feel more responsive and nimble, with a more fun-to-drive attitude than before. The Cruze's steering isn't uncharacteristically light, it's nicely weighted at high speed and isn't too light at low speeds. The car's chassis plays along; it's planted and responsive to steering inputs. Top Premier trims get an improved Watt’s link rear suspension arrangement, for crisper roadholding, while the rest of the lineup uses a conventional torsion-beam setup. All versions have rack-mounted electric power steering, and extended-life Duralife rotors for the four-wheel disc setup. It's no sport sedan, but it handles more confidently and better than some of its Japanese and Korean competitors. Like most compacts, ride quality is a matter of wheel choice, but even shot with big 18-inchers and a smear of tire around the wheels, the Cruze has decent road manners without being too harsh. We've sampled the sedan in a few flavors, and the hatchback in top RS spec with 18-inch wheels and a boomy back seat for sound to resonate, and the Cruze hasn't disappointed. It's smooth and compliant, without being noisy or unnecessarily harsh. The Cruze's ride is among the tops in the class. Spacious for the compact class, the Cruze is good even for a mid-sizer. The Cruze sedan is longer and wider than several cars in the compact class, which benefits rear-seat passengers with more leg room and hip room than others. The hatchback narrows that track only slightly, and shaves 8 inches off the overall length, but still feels just as spacious inside for passengers. 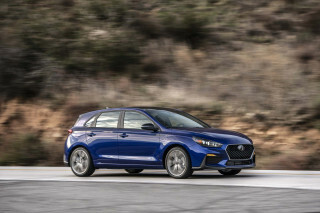 The sedan boasts an impressive 13.7 cubic feet of space in its trunk, while the more versatile hatch gets 23.7 cubic feet, which isn't bad for others in its segment—but not as much as some. The Civic Hatch has more, the Ford Focus does too. Fold down the second-row seats and the available space improves: more than 47 cubic feet. 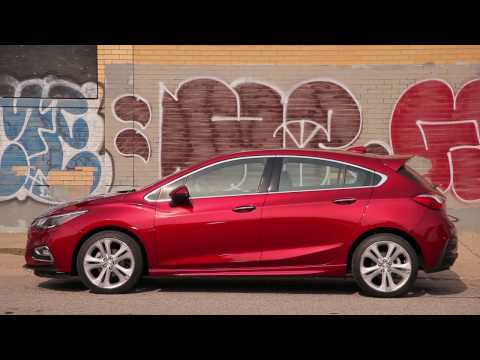 We say that's a byproduct of the hatch's curvy roofline, inherited from the sedan, that cuts into usable space to the point that the Cruze Hatch is slightly smaller than the subcompact Sonic hatchback. It's all in vertical room, you know. Overall, the Cruze makes the most of its usable space in terms of passenger packaging and space. The front seats are comfortable, with especially good bolstering in top-level Premier models. Rear seats will fits two normal-sized adults, complete with more leg and knee room than the aging Ford Focus or Hyundai Elantra. The NHTSA gives the Cruze four stars overall. The NHTSA says the Chevy Cruze merits a four-star overall rating. Front protection earns five stars, but side-impact and rollover-resistance scores pull it down to four. Limited crash data from the IIHS is fairly promising: the independent agency gave it top "Good" scores in a side impact crash and moderate front overlap crash test. Notwithstanding more crash ratings, the Chevrolet Cruze comes standard with an impressive list of safety features. A rearview camera is standard, as are 10 airbags around the car. The Cruze also comes with the standard complement of stability and traction control systems. The Cruze can be equipped with some active safety features, albeit with two noticeable omissions. The first package can add blind-spot monitors with rear cross-traffic alert, and a second package can add active lane control, forward collision alert, and automatic headlights. Neither package adds automatic emergency braking or adaptive cruise control, both of which can help propel the Cruze into our great graces for crash safety. Stay tuned as we patiently await more official data. Chevy MyLink is good—perhaps even better in upgraded versions—but base Cruze models are fairly plain. New for 2017, the Cruze Hatch is available in top LT and Premier trims, while the sedan carries forward with the same lineup from last year: base L, LS, LT and Premier models. All Cruze models come equipped with a 7.0-inch touchscreen for its infotainment that includes Apple CarPlay and Android Auto compatibility, and a standard rearview camera. Base L models aren't ones you're likely to see on the roads, though. Those models are geared more toward fleet sales, and are bare-bones only: 6-speed manual, 15-inch steel wheels with plastic wheel covers, and cloth upholstery. Base cars do come with air conditioning, a 60/40-split folding rear seat and manual-adjustable driver's seat. We're guessing more retail shoppers would consider the LS first, which includes decadent features such as standard floor mats and an optional automatic transmission. LT models are good values for their equipment and include features such as a six-speaker stereo with available satellite radio (subscription required), steering wheel-mounted controls, 16-inch wheels, fog lamps, and a space-saver spare tire rather than a tire rescue kit. Top-level Premier models add leather seating (which is surprisingly nice for a compact car), heated steering wheel and rear seats, an improved rear suspension setup, and 17-inch wheels. 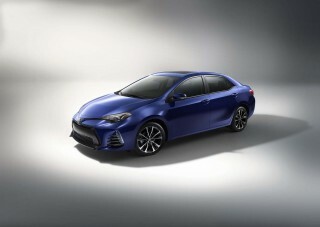 An available RS package for LT and Premier cars adds a sporty-looking exterior with unique front and rear fascias, rear spoiler, and large 18-inch wheels. We think money may be better spent in other places. Popular equipment packages include a bundle that adds a sunroof, upgraded 8.0-inch infotainment system, a color LCD instrument cluster display, and nine-speaker Bose audio system, cleverly dubbed "Sun and Sound." We say the upgraded infotainment system is the standout add-on in there, and could be worth the $2,000 upcharge—maybe. Compact buyers are savvy shoppers, so we say push hard for a deal on that package, if you can. A Driver Confidence package bundles blind-spot monitors and rear cross-traffic alert with rear parking assist sensors. On top-level Premier models, a Driver Confidence 2 package adds forward collision warnings, active lane control, and automatic headlights. We have a hard time recommending either package to buyers until adaptive cruise control or automatic emergency braking are folded into one or both packages. Like all Chevy vehicles, OnStar 4G LTE service, which can turn the car into a mobile wi-fi hotspot, is available on all trims. A three-month/3 GB trial is included on all new models, but a pricey monthly subscription is required past then. Already fairly fuel efficient, the Cruze sedan may leapfrog the class later this year with a new turbodiesel model. The 2017 Chevrolet Cruze is fairly fuel efficient for a compact car—even more so if you consider it to be a small mid-sizer. Manual-equipped sedans fare slightly worse: 28/39/31 mpg, according to the EPA. 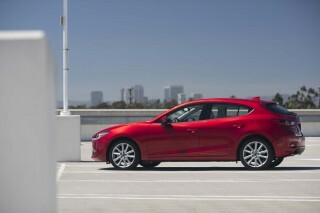 Opting for a bigger, hatchback version drops the fuel economy a little more, 29/38/32 mpg. Later this year, we expect Chevy to bring a long-awaited turbodiesel to the Cruze sedan (the hatch will come next year) that could improve highway mileage well into the 40 mpgs, and lead the rest of the pack. 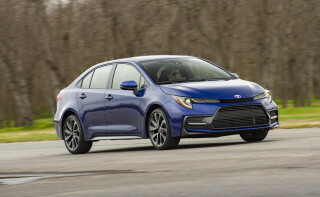 For now, the Cruze fares favorably to the Honda Civic lineup that averages around 35 mpg combined in most forms, and the Toyota Corolla family that fares in the low 30s. I did not expect to get such a quiet comfortable car for the price. No start up or heating problams during this year winter, one of the coldest in Québec. Efficient android auto connection. Accelaration ok... I did not expect to get such a quiet comfortable car for the price. No start up or heating problams during this year winter, one of the coldest in Québec. Looking for a different year of the Chevrolet Cruze?